Reading the Fire Heat Indicators briefly examined energy, temperature, and heat in thermodynamic systems, and introduced the two major categories of heat related fire behavior indicators: those that we can see (visual) and others that can be felt (tactile) as illustrated in Figure 1. As with each of the B-SAHF (building, smoke, air track, heat, and flame) indicators, it is essential that assessment of heat is integrated with other elements of the B-SAHF scheme to gain a clearer sense of fire conditions and likely fire behavior. Figure 2 illustrates the variations in temperature that firefighters may encounter during operations in a highly compartmentalized, multi-level structure. It is important to note that temperature varies from compartment to compartment and at different levels within each compartment. 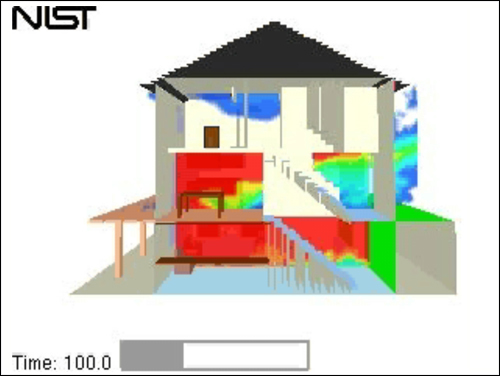 Note: Adapted from National Institute of Standards and Technology (NIST) Visualization techniques, Slice animation of a townhouse kitchen fire. 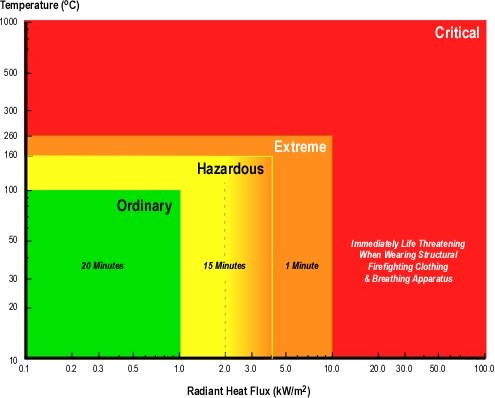 Thermal exposure can be divided into four categories: Ordinary, Hazardous, Extreme, and Critical (Foster & Roberts, 1995; Donnelly, Davis, Lawson, J., Selpak, 2006). As illustrated in Figure 3. Note: Adapted from Measurements of the firefighting environment. Central Fire Brigades Advisory Council Research Report 61/1994 by J.A. Foster & G.V. Roberts, 1995. London: Department for Communities and Local Government and Thermal Environment for Electronic Equipment Used by First Responders by M.K. Donnelly, W.D. Davis, J.R. Lawson, & M.J. Selepak, 2006, Gaithersburg, MD: National Institute of Standards and Technology. Of necessity, firefighters are insulated from their environment, delaying tactile perception of changes in temperature and heat flux. Perception of temperature is influenced by a wide range of factors and varies considerably from individual to individual. Firefighters focused on the task at hand may not notice subtle changes in temperature and heat flux. Temperature and heat flux do not always present obvious visual indicators. Conditions can change extremely rapidly, particularly as the fire approaches flashover. Firefighters may ignore warning signs of worsening conditions, believing that it is part of the job to tolerate extreme conditions. Firefighters must have a sound understanding of the thermal environment encountered during firefighting operations and the, at times, subtle indicators of changing thermal conditions. 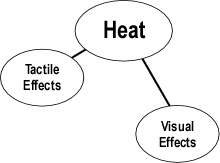 Tactile effects include sensing temperature or temperature change. Firefighters may sense temperature and changes in temperature, but as noted earlier, this is limited by the extent of thermal protection provided by their protective clothing and focus on the task at hand. 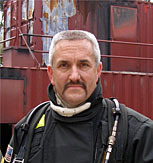 Firefighters’ protective clothing effectively insulates them from the thermal hazards typically encountered in firefighting. The multiple layers of insulation in the protective ensemble slows (but does not stop) heat transfer. This time lag makes it difficult for the firefighter to appreciate their thermal exposure (Bryner, Madrzykowski, & Stroup, 2005). 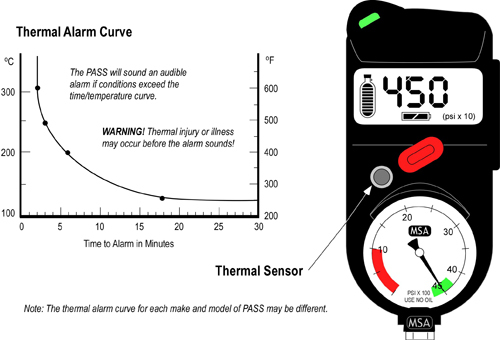 Firefighter’s personal alert safety system (PASS) devices may be equipped with a temperature sensing function that provides warning at a specified exposure value when the specified temperature is exceeded for a specified time period (Figure 4). However, National Fire Protection Association 1982 Standard on Personal Alert Safety Systems (PASS) (NFPA, 2007) does not address thermal sensing and there is not standardized test protocol for these types of devices (Bryner, Madrzykowski, & Stroup, 2005). Thermal sensing devices use a temperature response curve to provide warning for long duration exposure to lower temperature and short duration exposure to higher temperature. However, during rapid increases in temperature such as those encountered in flashover or other forms of rapid fire development, adequate early warning to permit egress is unlikely due to limited sensitivity of the sensors (Bryner, Madrzykowski, & Stroup, 2005). While firefighters must be attentive to heat level and temperature change, it is often difficult to perceive these changes quickly enough to react to rapidly developing fire conditions. This reinforces the importance of integrating all the fire behavior indicators in your ongoing size-up and dynamic risk assessment. The next post will conclude this look at Heat Indicators with examination of visual effects. While temperature and heat transfer cannot be observed directly, there are a number of ways in which firefighters can see the effects of temperature and heat. Bryner, N., Madrzykowski, D., Stroup, D. (2005). Performance of thermal exposure sensors in personal alert safety system (PASS) devices, NISTR 7294. Retrieved August 19, 2009 from http://www.fire.nist.gov/bfrlpubs/NIST_IR_7294.pdf.